Trees , 15 to 30 m; crowns open. Bark gray to brown, deeply furrowed with interlacing ridges. Wood brittle. Branches not winged; twigs gray-brown, pubescent. Buds dark brown, ovoid, glabrous; scales light brown, shiny, glabrous to slightly pubescent. 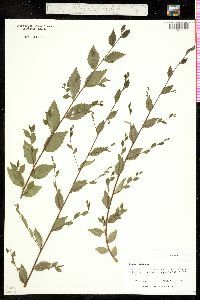 Leaves: petiole 2-4 mm, glabrous. Leaf blade narrowly elliptic to lanceolate, 2-6.5 × 2-3.5 cm, base generally not oblique, margins singly serrate, apex acute; surfaces abaxially with some pubescence in axils of veins, adaxially glabrous; lateral veins forking to 3 times per side. Inflorescences tightly clustered fascicles, 6-15-flowered, 0.5 cm, flowers and fruits not pendulous, sessile. Flowers: calyx shallowly lobed, lobes 4-5, glabrous; stamens 4-8; anthers brownish red; stigmas green, lobes exserted. Samaras yellow-cream, orbiculate, 10-14 mm diam., broadly winged, glabrous, tip notched 1/3-1/2 its length. Seeds thickened, not inflated. 2 n = 28. Flowering late winter-early spring. Commonly escaping from cultivation, waste places, roadsides, fencerows; 0-2200 m; N.B., Ont., Que. ; Ala., Ariz., Ark., Calif., Colo., Conn., D.C., Fla., Ga., Idaho, Ill., Ind., Iowa, Kans., Ky., La., Md., Mass., Mich., Minn., Mo., Mont., Nebr., Nev., N.J., N.Mex., N.Y., N.Dak., Ohio, Okla., Pa., S.Dak., Tenn., Tex., Utah, Va., Wis., Wyo. ; Asia. Ulmus pumila probably occurs in Vermont and West Virginia, but it has not been documented for those states. Planted for quick-growing windbreaks, Ulmus pumila has weak wood, and its branches break easily in mature trees. 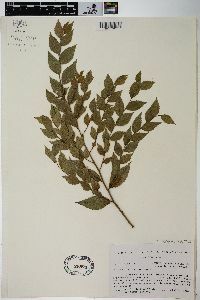 It is easily distinguished from other North American elms by its singly serrate leaf margins. Ulmus pumila is similar to U . parvifolia Jacquin with its small, singly serrate leaves. Ulmus parvifolia , however, has smooth bark that sheds from tan to orange, and it flowers and sets fruit in the fall. 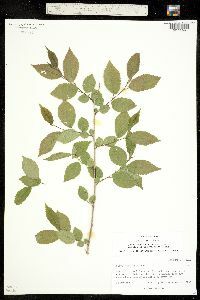 Plant: tree; to 8 m tall in AZ, frequently root-sprouting; buds spherical to subspherical; bark of mature trunk gray to brown, rough Leaves: blade ovate to lanceolate (occasionally obovate), 2-6.5(7.5) cm long, (1.5)2-3.5 cm wide, nearly symmetrical, the apex acute to acuminate, glabrous to scabrous above, glabrous below with tufts of hair and/or domatia in vein axils; margins once or twice serrate; 0-3(4) of the lateral veins forking per side INFLORESCENCE: sessile fascicles appearing before the leaves Flowers: calyx 4-5-lobed; stamens 4-8; styles persistent, deeply 2-lobed Fruit: SAMARAS nearly circular, flat, 1-1.4 cm long, notched apically, without marginal hairs; SEEDS thickened, not inflated Misc: Widely cultivated, naturalized or weedy in riparian areas and developed land (including roadsides); 350-2450 m (1100-8000 ft); Feb-Mar (fr. at least Mar-Apr) REFERENCES: Brasher, Jeffrey W. 2003. 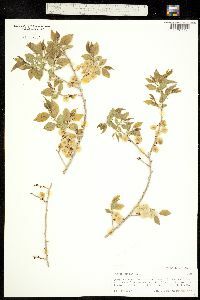 Ulmaceae. J. Ariz. - Nev. Acad. Sci. Volume 35(2). Medium-sized to large tree 18 - 26 m tall, trunk diameter 40 cm - 1 m Leaves: alternate, short-stalked, dark green and shiny above, paler beneath, 3 - 7 cm long, half as wide, and elliptical to elliptical lance-shaped with a slightly asymmetrical, tapering or rounded base and short-pointed tip. It is also toothed, thin, and firm. Flowers: in drooping, crowded clusters, short-stalked, greenish, small, without petals. Fruit: single-seeded, winged (samara), 1 - 1.5 cm long, nearly round, and lacking a notched tip. Bark: dark gray or brown, thick, and deeply fissured with a network of broad, interlacing ridges. Orange inner bark layer visible in fissures. Twigs: slender, brittle, and green, becoming grayish brown. 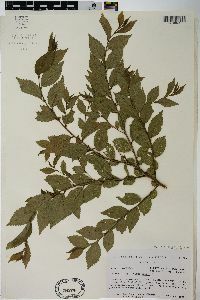 Leaf scars half-round and covered with a corky layer. Bundle scars three. Buds: dark reddish brown, 1 - 3 mm long, oblong to spherical, somewhat hairy. Flower buds numerous, relatively large, and spherical. Form: open and broadly rounded with many dead branches. Trunk short and thick, soon dividing into several large, wide-spreading limbs. 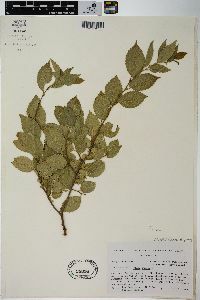 Similar species: In the Chicago Region, Ulmus pumila is distinguished from the native elms by its small (3 - 7 cm long), hairless, singly toothed leaves and hairless samaras. 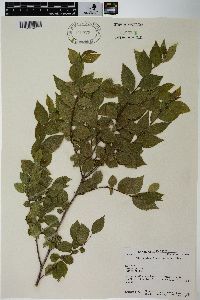 The hybrid U. x notha, of which U. pumila is a parent, differs by having middle bud scales fringed with white hairs and terminal bud scales fringed with reddish brown hairs. 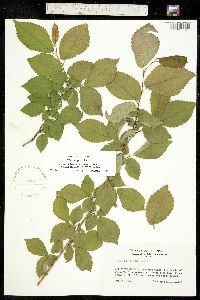 Leaves of the genus Celtis, which are similar in appearance, exhibit three main veins arising from the base of each blade. Habitat and ecology: Introduced from Asia. Widely planted because of its fast growth, this weedy species has seeded itself freely in the waste ground of cities, towns, farms, and on railroad ballast. It can form thickets with hundreds of seedlings, and will grow in a variety of soil types. 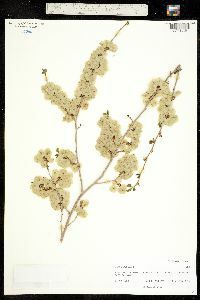 Notes: Ulmus pumila is grown chiefly as an ornamental, but is undesirable as a lawn and street tree because dead branchlets are constantly shedding. 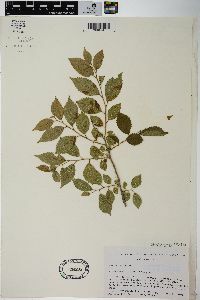 However, U. pumila has a high resistance to Dutch elm disease and phloem necrosis. Etymology: Ulmus is the Latin word for elm. Pumila means dwarf.